This is one of the whiskies in our cupboard which has a (brief) story behind it. Like the Caol Ila 18, this one is a pick by the wife. While in Edinburgh a year ago, we stopped by the very same whisky shop where my single-malt obsession began many years ago. A friendly, energetic woman invited us for a taste of her wares and had on a little table a number of Balblair, anCnoc, Speyburn and Old Pulteney whiskies. These are all owned by the same conglomerate, ThaiBev. We tried the anCnocs and my wife was quite taken by the one in black — the Rascan. 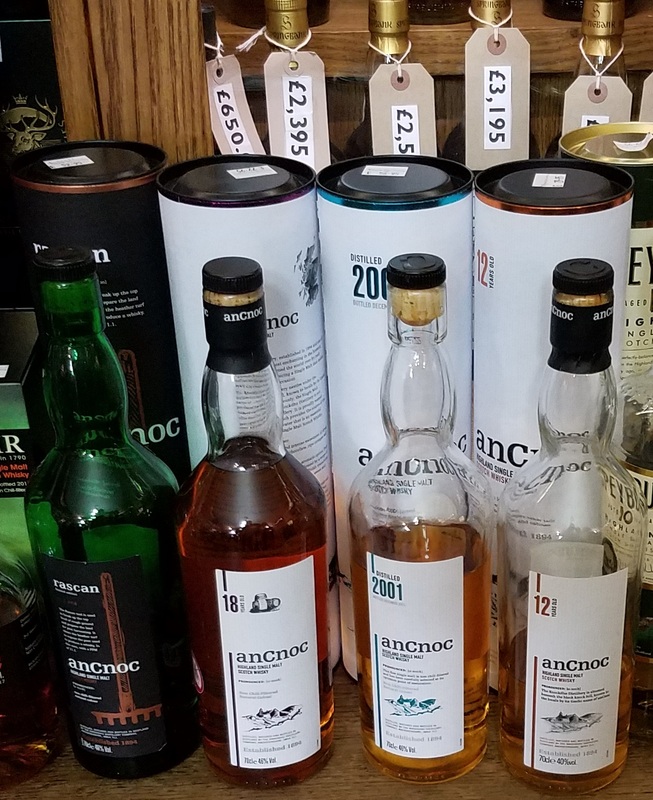 I remember liking all three of the anCnoc whiskies, so when the anCnoc 12 appeared at our local shop, I was amenable when the wife suggested we give it a go. In the photo left, you can see the white canister and bottle label. anCnoc uses a clean, modern aesthetic with their packaging with just a few adornments. The aesthetic is not as aggressively modern as Bruichladdich, but a nice change from the heavily adorned offerings from Balvenie for example. The 12 shows a badge as a triple medal winner in 2016, and claims “Light and smooth, complex smoky taste with a soft note of malt and nuttiness.” I don’t like to read tasting notes before I try an expression but I can work with this, it’s not as overwrought as some tasting notes. The back has some text giving the history of Knockdhu Distillery, which produces this malt, and the ‘mysterious’ Knock Hill (anCnoc in Gaelic) from which the whisky gets its name. 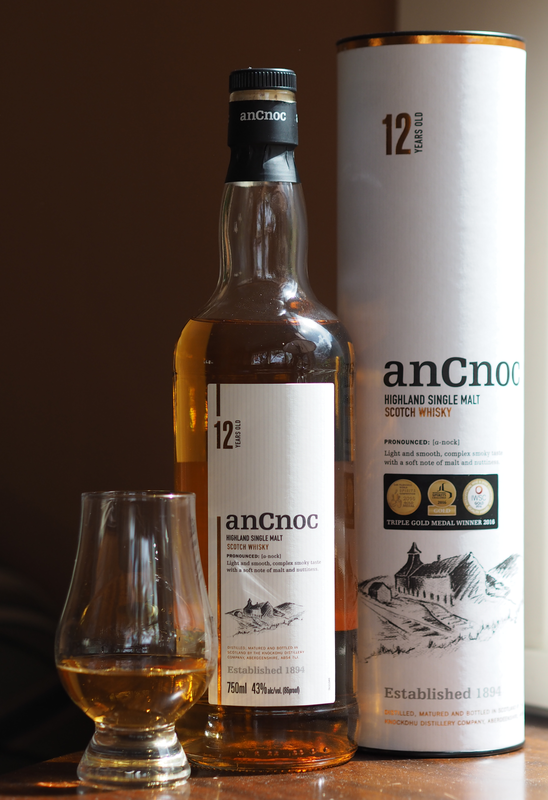 The anCnoc 12 is a light amber spirit that describes itself as Highland. Knockdhu is 20 miles Northeast of Dufftown, in the hills between the Spey and Deveron rivers. It’s a small distillery, doing tours by invitation only but receiving good reviews on Google. One can infer from the photos of the distillery that the might of ThaiBev is not felt strongly under the shadow of anCnoc hill. Operations look workmanlike and unadorned, reminiscent of Bunnahabhain. Nose: Slightly spicy and delicate. Peach, banana and the barest whiff of mineral peatiness; I could detect no smoke despite label’s claim to it. Palate: Delightful: tropical fruit, cotton candy. It does deliver a midrange nuttiness and a decent dose of tannins to balance the sweet stuff. Finish: Delicate, lasts for a bit. The tannins clean up the tutti-frutti palate quite well. Bottom line: For $52, a great light dram for festive times. Not tremendously introspective, but provides sufficient fun and complexity for the price. Less unctuous than Glenmorangie but has more going on the palate than the Glen 10. A closer comparison would be Oban 14. However, the Oban has a sturdier, more oakey and mineral nose, with a palate that is nuttier and more complex, less sweet and fruity than anCnoc. The Oban’s finish also has more midpalate tannins for a dryer finish. Where Oban is a grown-up’s Highland, anCnoc is a party Highland. It’s also $20 less expensive than Oban 14. anCnoc 12 would be a good choice for a lighter Highland style when you want something fun. This entry was posted in Scotch-single malt, Whisky and tagged anCnoc, Highland, Scotch, Whisky. Bookmark the permalink.